The croton petra (Codiaeum variegatum) is a variety of croton plant. It can be grown successfully as a house plant or outdoors in tropical landscapes. The plant has brightly colored green, gold, yellow, rust and red foliage. Grown outdoors, the plant can attain a height of 5 to 6 feet; but, when grown inside, it can remain a small potted plant. Croton petra plants are considered poisonous if consumed. Croton petra plants enjoy being grown in full sunlight with moist soil conditions. The plants also thrive on high humidity. They enjoy a room temperature of around 80 degrees F. If the croton petra is allowed to dry out for an extended time period, the plant will often begin to wilt severely. Plant croton petra plants outside in well-drained soil with adequate mulch to prevent the soil from drying out during hot spells. Croton petra plants can be easily rooted simply by their leaves. To do so, remove a leaf and place the stem in water or moist soil. Soon roots will emerge and the leaf will root. The leaves are also used frequently in flower arrangements. Sunlight helps to bring out the foliage color of the croton petra. The stronger the sunlight, the brighter the colors that the plant develops. 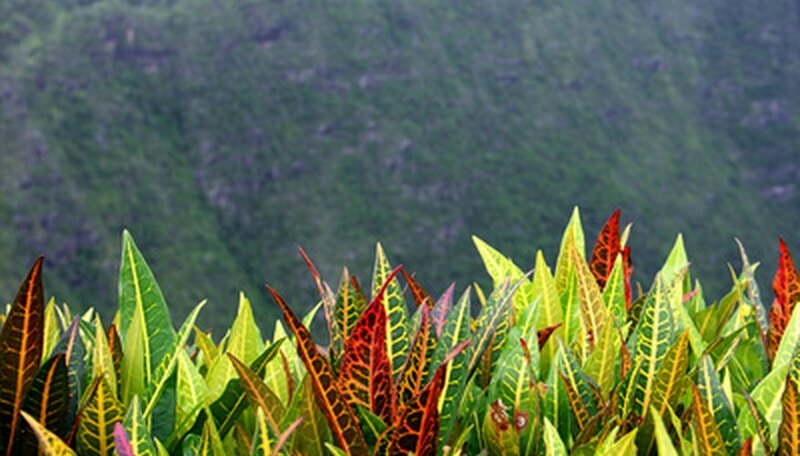 Crotons that are planted in the shade tend to only develop green leaf colors. A south-facing window in a home is usually ideal, or under a skylight. Plant croton petra plants outside in tropical regions where they can receive full sunlight. When grown outside, the croton petra will often require light pruning in the spring to remove dead foliage, stems and to shape the shrub. It is advised that one-third of the plant be cut back during the spring. Houseplants can also benefit from the removal of any dead foliage or deformed leaves. The sap of the croton petra can easily stain clothing, upholstery and other surfaces. When the foliage is torn or punctured it leaks a large quantity of the white substance. The sap also irritates skin.